PREPARE Postgraduate Course in March, 2019. The course ‘Strengthening prepardeness for (re-) emerging arbovirus infections: symptoms, diagnostics, clinical managment and outbreak control’, part of the EU-PREPARE program, has been announced. The course will be run in Ljubljana, Slovenia, from 19-21 March, 2019. ESCMID is seeking proposals for 4 new postgraduate courses outside of Europe in 2019. Of interest are courses from Asia, Eastern Europe, Central and South America, and Africa. In a retrospective 13-year cohort study, Rottenstreich et al investigated the incidence, risk factors, clinical course and outcomes of pregnancy-related group A streptococcus (GAS) infection. Of 124 women, 115 (93%) were in the puerperium, an incidence of 0.8 cases/1,000 live births ([95% CI] [0.7-0.9]). 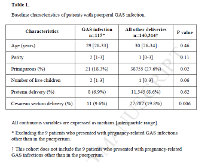 A multivariate analysis showed primiparity and cesarean delivery to be independent protective factors against puerperal GAS infection (adjusted odds ratios [95% CI]: 0.60 (0.38, 0.97) and 0.44 (0.23, 0.81), respectively). Of the nine remaining patients, eight were diagnosed following first trimester abortions and one had an infected ectopic pregnancy. Among the entire cohort (n=124), the predominant manifestations were fever and abdominal tenderness. Twenty-eight (23%) patients had severe GAS infections. All infections were treated with beta-lactams and most patients (n=104, 84%) received clindamycin. Four patients (3%) required surgical intervention; the rest fully recovered with conservative medical treatment including antibiotics. There were no recurrences, maternal deaths or neonatal complications. The results of the study highlight the importance of community-acquired GAS and supports shifting efforts from infection-control oriented nosocomial investigations to screening and prevention-driven policies. In 2018, ESCMID approved a new study group (SG) for studying host-microbiota interactions. The overall aim of this new SG is to bridge diagnostic, clinical and scientific specialties across the relatively new field of microbiota research in Europe. Microbiota research concerned will cover intestinal, urogenital, respiratory and skin microbiota of both humans and animals and will include studies on the interactions of microbiota with the host immune response. The central theme will be focused on clinical significance of and therapeutic interventions on host-microbiota associated diseases and health. We are especially looking for 1) members who are interested to contribute in Horizon 2020 & ESCMID research funding to apply for funding on microbiota research and 2) members who want to contribute in a review article for publication in CMI on our future position. However, every scientist/physician with interest in microbiota is welcome! Please visit the website for a membership application (ESGHAMI).